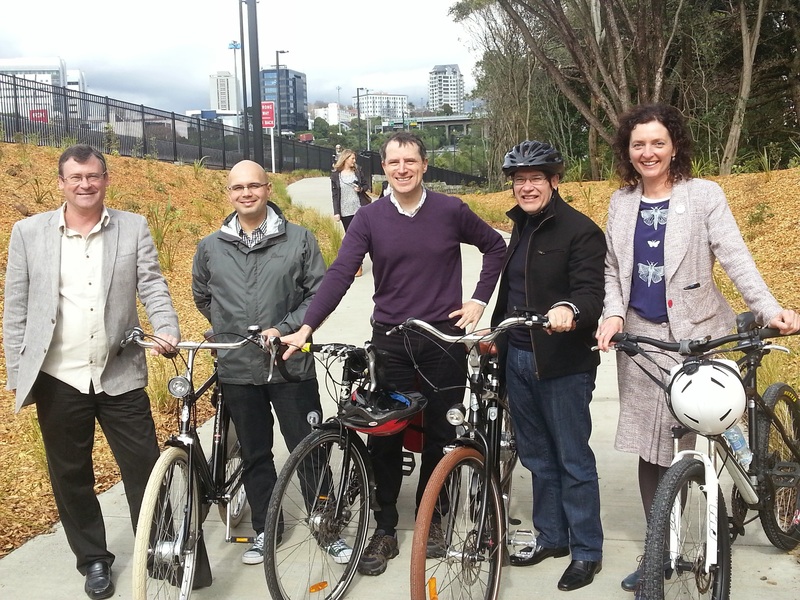 It was an uncomplicated pleasure to attend the opening of the Grafton Cycleway on the morning of 6 September. 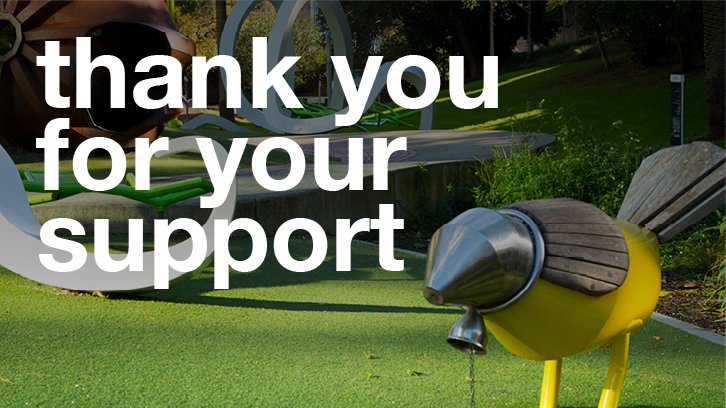 I have been watching the construction of the cycleway along the edge of the Grafton Gully with great anticipation. The word ‘transformational’ is somewhat over-used in the current Council parlance but in this case it is entirely appropriate. The benefits of this project are three-fold: it forms a ‘trunk line’ in the city’s cycling network, it is a fully dedicated cycleway in a city that has for the best part of a century been given over to motorised transport, and it allows access to the forested gully that bisects the central city and has been off-limits to walkers and bike riders since the 1960s. The Grafton Cycleway (built by New Zealand Transport Agency (NZTA)) connects to Beach Road Cycleway (built by Auckland Transport (AT)), Auckland’s first protected on-road cycleway. This cycleway is the fruit of the combined labours of three separate groups: the cycling advocates, politicians, and the unique hybrid of planner and traffic engineer needed for these projects, ‘Plan-gineers’. 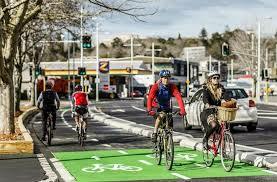 The project started as a result of the persistent advocacy of Cycle Action Auckland (CAA), led by an indefatigable Barbara Cuthbert, to the NZTA. NZTA understood that they had long neglected cycling in Auckland and although they didn’t own land in the central city, they did own the land around the motorway junction encircling the city. In a pragmatic compromise, CAA worked with NZTA to plan for the cycleway connection in its current place. That plan was shelved in 2011 when NZTA had cashflow issues but CAA revived the idea in 2012 and found a receptive audience in the unitary Auckland Council which was now prepared to treat the route more like a park and an urban design opportunity than simply a transport corridor. 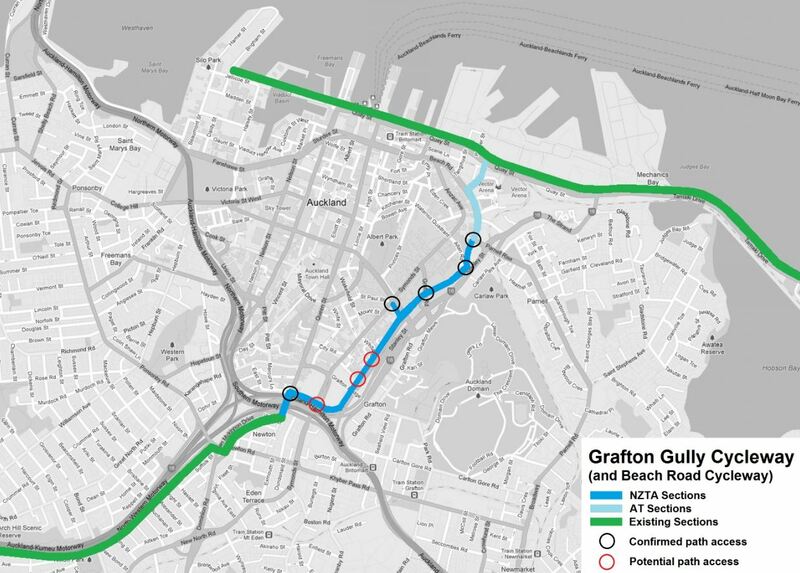 AT revived older plans for Beach Road cycle facilities to connect the Grafton Cycleway to the Waterfront Boulevard that had just been announced by Waterfront Auckland. The Waitematā Local Board, of which I am a member, has championed the project from its inception and has been particularly activist in the past year urging AT to ensure that the Beach Road Cycleway was completed in time to connect with the Grafton Cycleway at the time it was officially opened. There was some doubt in the early months of 2014 as to whether this would happen but staunch advocacy particularly from Local Board Chair, Shale Chambers, and Deputy Chair and Transport Portfolio lead, Pippa Coom, got it done. Of course, it would be remiss of me not to acknowledge the excellent work of NZTA and AT plan-gineers in completing the project to the high standard to which it has been finished. So, what’s it like to ride on? Very smooth with plenty of room to maneuver around walkers and bike riders coming from the other direction. The path is four metres wide most of the way, down to three metres at pinch points. There are some rather steep sections, in parts up to 6% grade, but they are short and are more than made up for by the beautiful, long descent into the city when riding northward along the cycleway. 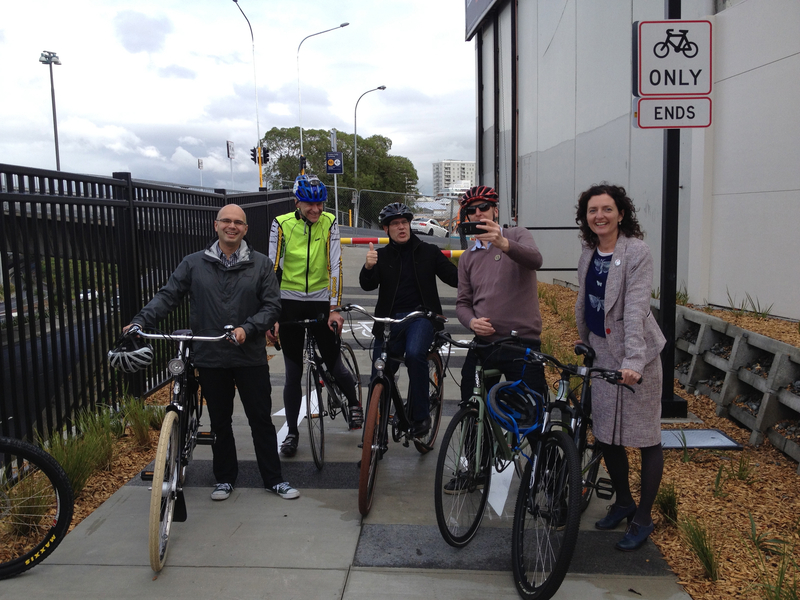 In all, an amazing piece of work and one that has really upped the game in Auckland for bike riders. Just ten years ago, the idea that someone could ride from Te Atatu (Māori for ‘the dawn’) in West Auckland to the waterfront would have been considered a pipe dream but today I did just that. 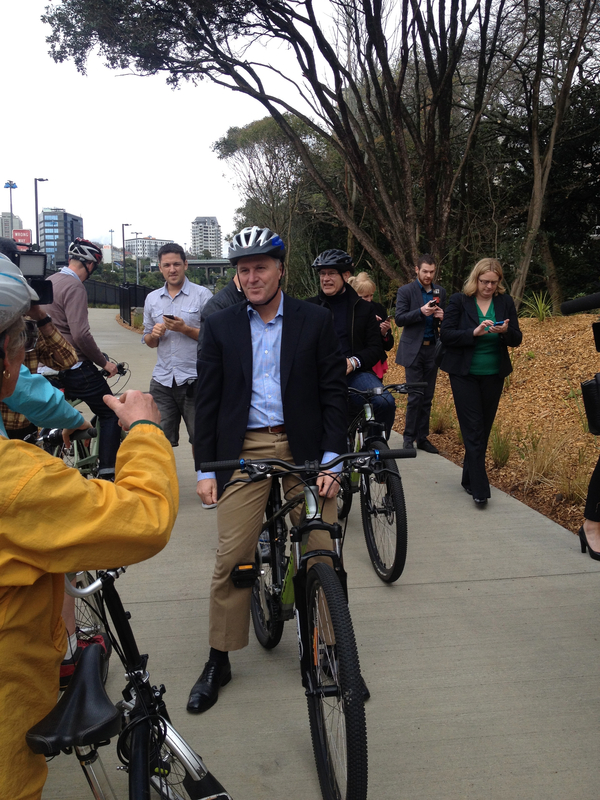 Indeed, this is no less than the dawn of a new era for Auckland; the completion of this cycleway is a model for the scale and complexity of what can be achieved under a unitary council working with central government and with an ear for good ideas coming from advocacy groups in the community. Auckland Council and AT have just acknowledged that they will be implementing trial protected cycleways on four new routes in the city centre, including K Road, by the end of 2014 so there is a lot more to come. UPDATE: Auckland Transport Blog have put up a couple of videos of riding the cycleway between Upper Queen Street and Waterfront Boulevard going downhill and uphill.